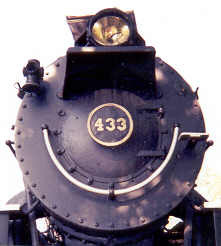 Steam locomotive number 433 stands at the trailhead of the Virginia Creeper Trail in Abingdon, Virginia. The modernist poem "The Waste Land" by T. S. Eliot is often cited as having a line count of 433, but actually contains one more. The error is due to the author himself footnoting some of the last lines incorrectly. The number of the billiards/pool hall in the "Police Academy 2" picture. The Chandler Wobble has a period of 433 days. The imposing rocks of the Lorelei are 433 feet above the Rhine.